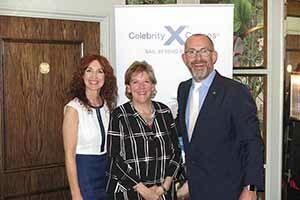 Celebrity Cruises intends home porting a ship in Ireland in 2010, and is considering a full season should the numbers justify it. Celebrity will return with another ship in 2019. Valerie Murphy. Jo Rzymowska and Michael English of Celebrity Cruise Line updated the trade on progress with Celebrity Edge, due to launch in six weeks. Watch here full speech by Jo Rzymowska at the event.